I remember when I reviewed Jackass Presents: Bad Grandpa when it came out the first year that Film Feeder was active, and I specifically recall pointing out how it seemed to be the first Jackass movie that had a slightly more emotional drive behind it, largely because it was the first movie that the team made following the tragic death of cast member Ryan Dunn, which itself reflected onto that film’s subtler themes of mortality and human connections (amidst all the crazy and dangerous stunt work, of course). 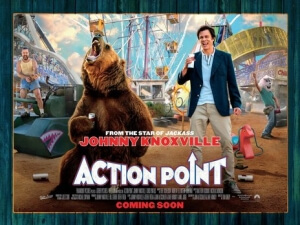 Though Action Point wasn’t made by the Jackass team specifically, although it does feature cast members Johnny Knoxville and Chris Pontius as well as a lot of intensely physical stunts, it still feels like an evolution of those themes that Bad Grandpa set up, only here it’s in a narrative that looks at all the debauchery in a (slightly) more mature light, and has enough heart to carry itself amidst all the shenanigans happening all over the place. It also feels like a natural swansong for this kind of film that Knoxville tends to make and star in, and if that’s the case then it’s a perfectly serviceable movie to go out on; while it’s not always a laugh riot, it has a fair number of amusing gags, impressively painful stunt work, and as mentioned before a beating heart that shows a different side to this performer than you’ve likely seen before. Set in the summer of 1979 (though told via flashback by Knoxville, in the same Oscar-nominated old-age make-up he put on for Bad Grandpa), our hero is Knoxville’s D.C., the owner and manager of a very rundown theme park named Action Point, where the rides and facilities are extremely dangerous, but nobody really cares because the important thing is that they’re all having fun. Whilst D.C.’s teenage daughter Boogie (Eleanor Worthington Cox) is visiting for the summer, the park faces numerous difficulties from a new corporate theme park that’s stealing their attendance, not to mention the fact that the bank has begun demanding repayment for a hefty loan that D.C. took out, so D.C., Boogie and his ragtag team of staff spring into action to try and save the park from fading into obscurity, one massively painful stunt-based episode at a time. The best way to enjoy this movie is to know exactly what kind of movie you’re going into, that being a silly comedy with plenty of mindless slapstick, raunchy humour, and an alarming lack of consequences for some of the highly dangerous stuff these guys are pulling off. If that’s not the kind of movie that gets you into a fit of giggles, then you probably won’t enjoy Action Point all that much; in my case, I kind of knew that’s what this was going to be already, especially seeing how it was a movie starring Johnny Knoxville and was advertised almost like it was a Jackass movie, and I got just about as much enjoyment out of this as I was expecting, which luckily was a fair amount given how much I find anything Jackass-related so fun to watch. The stunts are very well performed, not to mention very funny at times, and while there are certainly gags in this movie that I otherwise would have not found all that appealing in other movies like this, here they’re all done with a clear amount of passion and light-heartedness that it’s impossible to hate, because you admire how much fun these people are certainly having while making this movie, and thankfully it’s surprisingly just as fun to watch. It’s also interesting seeing Knoxville in a role that’s certainly tailor-made for a physical entertainer such as himself, but it’s not one where he’s sleepwalking through it either; he is a very likeable and charming presence here, even when you don’t necessarily agree with everything his character ends up doing, and again he’s clearly having a ball doing all this crazy stuff while also providing the movie with a solid enough heart, itself brought about by a sweet relationship he shares with young Eleanor Worthington Cox who is also very likeable as his more level-headed daughter. It’s not, however, a perfect comedy; there are jokes, and scenes, that don’t land as well as others, and every so often things will just come to a grinding halt so that they can perform a major stunt that has no real reason for being there, except for the fact that it’s got Jackass people in it and they think they’ve got to give the people what they want. The film also has a wrap-around segment that strongly feels like it was added during reshoots, because it’s shot differently and has a very dissimilar tone than the rest of the film, and while it’s not necessarily a bad addition it is still jarring in how it doesn’t seem to match much else about this movie, and it can really take you out of the story every time, figuratively and literally. However, the jokes that do land are amusing enough to leave you in a decent mood, and the film has a surprisingly sweet heart to it that a lot of the debauchery can honestly be forgiven because, once again, you can tell that there was such intense passion behind this film, and they all clearly had tons of fun making it which honestly makes all the difference. This is perhaps the most mature I’ve seen some of these Jackass alumni perform on-screen, which is saying something given that this is still a pretty silly and often stupid comedy filled with prat-falls and dangerous stunt work. You can tell that the untimely passing of Ryan Dunn has changed their outlook on this kind of comedy forever, and has caused them to be a bit more considerate in how they perform, because like Dunn undoubtedly did they have no way of knowing how much longer they can keep doing these kinds of things, and want to preserve what little of life they have left. That’s really what’s at the gooey centre of Action Point, a movie that’s about having fun but also acknowledging how too much can be just as dangerous as the craziest stunt you’ll see in any Jackass skit. Action Point is likely to give Jackass fans what they’re expecting, that being a series of passionate and often hilarious stunt work as well as other amusing stabs at comedy, but it also has a nice beating heart to it that shows a more mature side to their escapades.